The mission organization Joshua Project reports that there are presently 16,842 identified people groups in the world. Of these, it is believed that some 6,989 groups, or 41 percent of these groups, are unreached with the Gospel message. 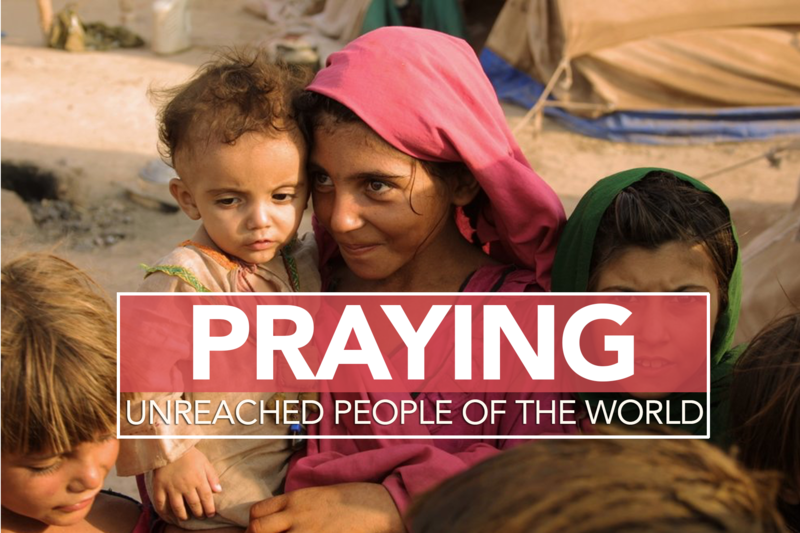 Join with us in praying for the unreached people groups of our world, as well as for efforts underway to take the life-giving message of the Gospel to its nations, tribes, people, and languages. Thank the Father for His ability and readiness to give, guide, and respond in response to our prayers (Matthew 7:7, 8). Thank the Father for pastors, ministers, teachers, and missionaries who are at work right now mobilizing resources to share the Gospel with unreached people groups (1 Thessalonians 1:2, 3; Ephesians 4:11, 12; Matthew 9:37, 38). Pray for revival in the Church that will cleanse, empower, and send believers out to reach the lost (Matthew 28:19, 20; 2 Corinthians 5:18–20). Pray for men, women, boys, and girls to respond to the call of God (Luke 10:2). Pray for an outpouring of God’s Spirit on unreached people groups bringing conviction of sin (Joel 2:28, 29). Pray for biblical dreams and visions and revelations of Jesus that will draw lost people to Him (Joel 2:28, 29). Pray for ongoing, powerful signs and wonders of healing, deliverance, and miracles that will draw individuals to the Gospel message (Mark 16:17–20; Romans 15:18, 19; Hebrews 2:4). Pray that as new believers are born into the kingdom they will be biblically discipled and will mature in their faith (Matthew 28:19, 20). Pray for the translation, printing, and distribution of God’s Word into all languages, as well as Christian radio and television ministries entering into new markets (Matthew 24:14).